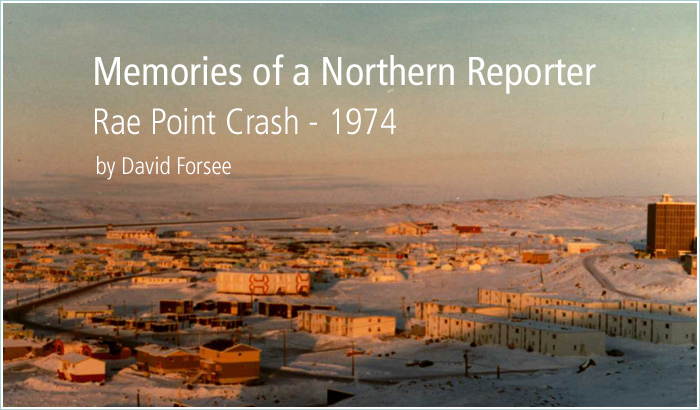 The phone rang in the newsroom at CBC Frobisher Bay.1 It was my RCMP contact at the local detachment. "I'll have to check with my boss," I said. I wasn't a reporter, I was officially an A/O - announce operator just beginning my career in the Northern Service. A week earlier the station's former newsperson had left the north for medical reasons and I was filling in as newsperson until a bona fide radio/TV journalist could be found. “I'll be there.” I packed my audio equipment, left a note for my boss, and called the station tech for a ride to the airport. On the way he explained how to use the new 16mm film camera. 1 In 1974, the year of this story, the Northern Service of the Canadian Broadcasting Corporation (C.B.C.) operated 5 radio stations in Canada's arctic. One was in Frobisher bay (now called Iquauit), the others were in Churchill, Manitoba, Yellowknife, Whitehorse, and Inuvik on the Mackenzie Delta in the far western arctic. The stations served a population of about 32 thousand people spread over 3 and a half million square miles. They were linked to each other and to the C.B.C. 's southern network by Canada's newly ascended Anik Satellite, the world's first national domestic satellite. Along with regular C.B.C. network programming, what the rest of Canada listened to on a daily basis, Anik brought colour TV to the North for the first time.